What does it mean to take up space? Ask children to bring some of their creations from the 10–10–10–10 Challenge to the circle (if available). Recall the materials they were given to work with: 10 grams of Styrofoam, 10 grams of aluminum foil, 10 grams of wooden stirrers, and 10 grams of plastic modeling clay. All four materials weighed exactly the same — 10 grams. What differences did you notice about how much of each material you were given? But they weigh the same. What do you mean? What is different? Talking points: This investigation introduces the concept of volume, but use the more descriptive phrase “takes up space” until the very end of the session. This phrase is more readily understood by children and it underscores the three–dimensional nature of the concept. How many sides does space have? How could we ever measure it? As the discussion winds down, tell students that, just as objects have height and weight, every object also takes up space. Put the tall pillar candle on the floor and use your hands to define the amount of space the candle takes up, moving two hands around and above the candle, to illustrate how much space this candle takes up. Modeling 3–dimensional objects: To demonstrate the meaning of how much space an object takes up, use both hands, in motion, to show all of the physical boundaries of an object — its top and bottom, its left and right boundaries, its front and back boundaries. By keeping your hands in motion, you focus attention on the size of the whole object — not only its height or length — and embody the three–dimensionality of the concept. Next place the maple block beside the candle and move your fingers around the block in a similar way, to illustrate how much space the wood block takes up. Which object takes up more space, the candle or the block of wood? What about this block of Styrofoam? How does it compare? Leave the Styrofoam block, pillar candle, and maple block in order for later reference. This is the heart of the investigation, where students put objects in order according to volume, here expressed as “the amount of space they take up.” Four objects are provided — three cubes and the plastic modeling clay — others students must imagine (three fruits). These students are uncertain where to put the two cubes. They are the same size, but have different weights. Where should they go? 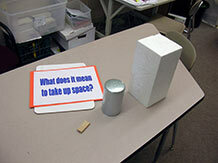 As students finish, have them draw the four objects, in order, in their notebooks, labeling each object. If there is more than one opinion about the order, each student can record the order that seems correct. As a group finishes ask each student to think of three pieces of fruit: one that takes up a lot of space, one that takes up very little space, and one in between. 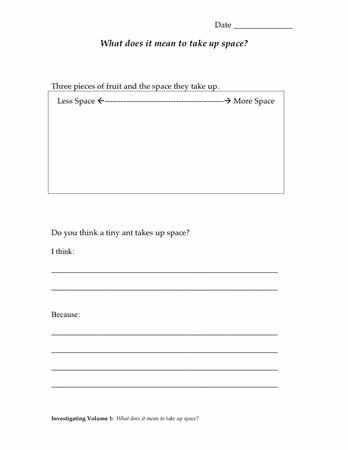 Have students draw and label the three pieces of fruit in their notebooks. This thought experiment is a higher–order exercise, requiring students to consider volume without handling the objects. If they need help, perhaps suggest that they model the fruit in the air with their hands. Have students bring their investigation materials (the centimeter cube, the copper and pine cubes, and the 100g plastic modeling clay cube) to the discussion. 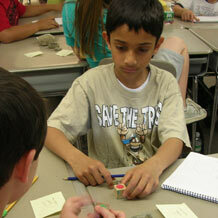 Ask if any one group disagreed about how to order the cubes and plastic modeling clay. If yes, have that group to put their set of cubes in order. What does the rest of the class think? Resolve any other uncertainties in the same way. Who can combine their line of 4 cubes with the order line we made earlier (with the Styrofoam, candle, and wooden block) so that there’s a single line of objects ordered by the amount of space each of the objects takes up? Take volunteers but have the whole class consult on the exercise, stopping only when you have consensus. Leave this merged order line set up in the classroom for later reference. Ask different students to share their ‘three fruits’ orders with the rest of the group. If there’s time, have students say where some of the fruits might go in the class order line. Finally, return to the investigation question: What does it mean to take up space? Are students learning to see the three–dimensional space that an object occupies, and to compare the magnitudes of these spaces across a set of objects? Do they understand how it is different from height and length and weight? Do they think they’ll be able to add new objects to this new order line? How can we describe the amount of space an object takes up? How in the world can we measure volume?